Whether you want to be a chunky monkey or a silly circus money, this costume is perfect! This 100% polyester costume is a soft brown bodysuit with a tan belly that zippers up the back. There is a long tail underneath the zipper. 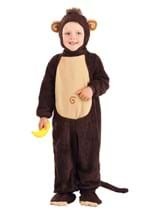 The costume comes with a monkey headpiece that fits over the head and velcros in the back. The headpiece has ears and exposes the face. The matching soft brown booties slip around the ankles and an elastic band goes around the shoes so the booties stay in place. If you like this costume, then check out our silly sock monkey costumes.